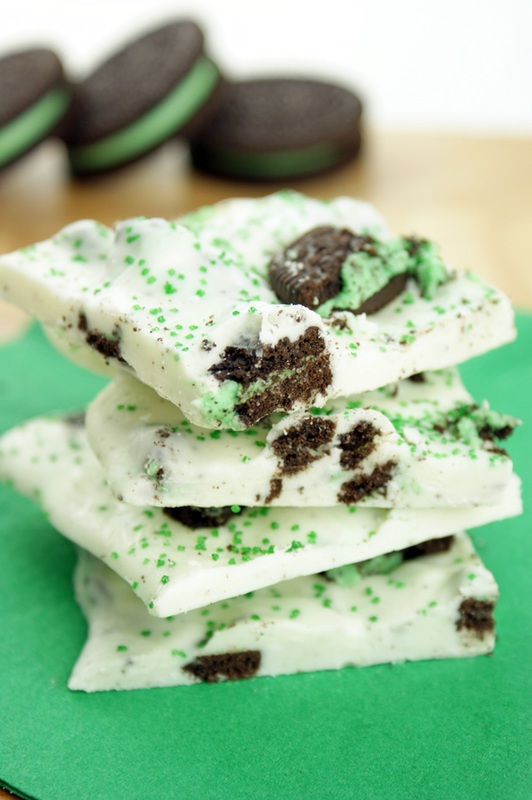 A winning combination of mint chocolate cookies pieces and Vanilla CANDIQUIK that is sure to be a hit! 2. Add ½ cup of the chopped OREO cookies into the tray and stir to combine. Pour mixture onto a large sheet of wax paper. Use a spatula to smooth out evenly to approximately 1/4″ thick. 3. Sprinkle remaining 1/4 cup crushed cookies and green sprinkles on top. Chill for about 10 minutes or until completely set. 4. Once set, cut or break into pieces. Option: You can also spread the bark mixture out onto a large sheet of wax paper on a flat surface (eliminating the use for the pan).